Considered to be the patron of farmers, peasants, day laborers, and rural communities. Isidore was born to very poor yet very pious Catholic parents in Madrid, Spain. His parents were unable to support him when he was a youth and sent him to work for a wealthy landowner, John de Vergas (He ended up working for him for the rest of his life). He married a very religious woman named Maria Torribia (also known as Maria de la Cabeza). She, like Isidore became a saint. They had one son who died unexpectedly as a child. Their grief inclined them to believe their son's death to be a sign from God and consequently vowed to live a life of perfect continence. Isidore frequented Holy Mass every morning but often reported to work late. Late, though he was, his plowing was nevertheless accomplished by angels that resulted in three times more productivity. His coworkers and his boss witnessed such miraculous events and accorded Isidore with great respect. 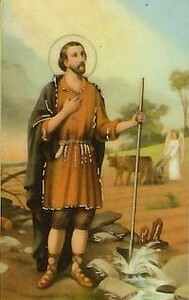 St. Isidore loved the poor and loved the animals. The miracle of the multiplication of food occurred when Isidore fed a flock of starving birds and on another time when Isidore shared his food with a large group of beggars. 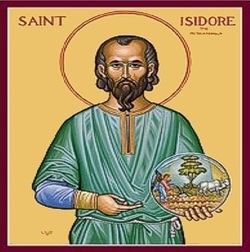 Isidore died on May 15, 1120 at 60 years of age and was canonized in 1622 along with four very notable Spanish saints. The group, known as "the five saints", included St. Ignatius of Loyola, St. Teresa of Avila, St. Francis Xavier, St. Phillip Neri, and St. Isidore. His body has been found incorrupt. His memorial is celebrated on May 15th on the Roman calendar.